Through the Millennium Cohort Study we have been following the lives of over 19, 500 children since they were born in the UK at the turn of the new century. We carry out regular surveys to collect information about participants’ physical, socio-emotional, cognitive and behavioural development over time, alongside detailed information on their daily life, behaviour and experiences. 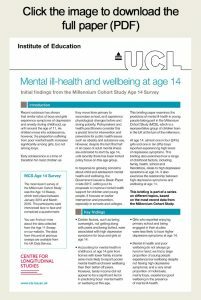 At at age 14, girls from homes with lower family income were more likely to report poorer mental health and lower wellbeing than their better-off peers. Girls who enjoyed primary school and felt engaged in their studies were less likely to have higher depressive symptoms at age 14. How common risk-taking behaviour is among teenagers in the UK. Which risky activities teenagers are more likely to get involved in, including substance use and anti-social behaviour. How risky behaviours differ according to teenagers’ backgrounds. the association between reading for pleasure and young people’s level of vocabulary. 20 per cent of MCS participants were obese at age 14 and a further 15 per cent were overweight. Between 11 and 14, most participants stayed in the same weight category. Boys were slightly more likely to have become normal weight than overweight or obese, while the opposite was the case for girls. 14-year-olds whose mothers had a low level of education were more likely to be of excess weight than those whose mothers had a degree. Boys were less sure; their average expectation was 63 per cent, and just under 10 per cent were absolutely convinced they would get to university. Compared to boys, the average hourly wage for the occupations that girls aspired to was a striking 27 per cent or £6.49 lower. 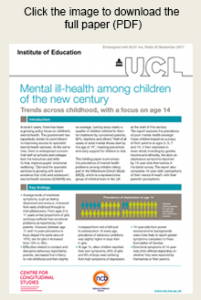 24 per cent of girls and 9 per cents of boys were depressed at age 14. 14-year-olds from better-off families were less likely to have high levels of depressive symptoms compared to their peers from poorer homes. Emotional symptoms of 14-year olds often differed depending on whether they were reported by themselves or their parents.